Can our digital tools help build habits? Well, sure they can. I’ve mentioned several times here how I use a combination of paper and digital tools for journalling. And a big part of my journalling is tracking the activities that I want to turn into regular habits. That has been taking place on paper for me. But I was recently intrigued by what Google has been doing with Calendar. If you use Google Calendar on your computer, you may not have seen what I’m referring to. An old post from David Kadavy recently resurfaced in my Medium feed (things must be slow). Titled What I Learned About Productivity While Working on Google Cal, he shares about Google’s acquisition of Timeful and how they were incorporating these features into Google Calendar. It caught my attention when I first read it and did so again. The catch? These features have not been added to all versions of Google Calendar. Just on mobile. The key feature is goals. 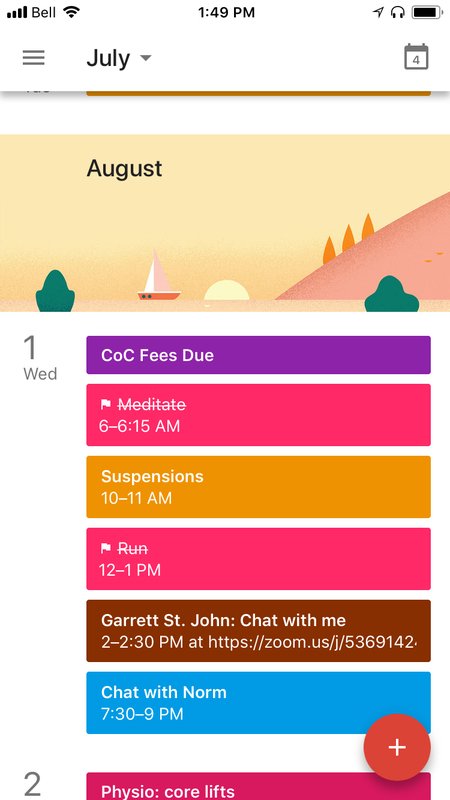 On the mobile app, you can add 4 types of items to your calendar: events, reminders, goals, or an out of office period. Three of these are quite self-explanatory. But the goals option is unique. With it, you can choose an activity you want to incorporate into your life on a regular basis. You tell the app how often you want to do it and for how long. It then finds spots in your calendar where the activity will fit. Nothing terribly impressive so far. Of course, you could schedule in these things yourself (and if you don’t use an app for this, you should add them manually — things that get on your calendar get done). I’ve enjoyed letting the app choose the days and times when I run. As I tend to look at my weekly schedule (usually a part of my weekly review) and pick 3–5 times myself, letting the machine do that for me has been a time saver. It’s just one less thing I need to do. But what about when it chooses a time that doesn’t fit? This is what has made the tool a good experience for me so far. First, I’m pretty flexible. So when I see that I have a run scheduled for the day, I don’t have to think about it much. If it’s a work day, I know it will happen around midday: I run on my lunch break and the exact time depends on booked meetings or my energy levels on meeting-less days. Second, since the app itself can integrate with iOS’s Health app, I can just forget about the time. If GoogleCalendar chooses 8–9 AM for my run, I can run whenever I want, and the app adjusts itself accordingly. You can see here that I ran around 12–1 PM. But while the event itself was originally scheduled for 8–9 AM, the integration ensures things are updated to reflect reality. And without me having to do anything. That’s a good experience. Last, the app is supposed to learn from your tendencies over time and get better at picking those spots. I haven’t been using it long enough for that to happen, but based on the early experience, I’m betting it does this well. So, can our apps help us build habits? Well, without the internal desire, no. But if you have a desire to change, then yes. By removing some friction and being adaptable, digital tools can help. I’m a big fan of Fantastical (it’s a great app and nicely ties together all my calendars from various sources), but I’ve been using both tools over the past few weeks.